As a small business and maker, I live by the budget. Because if I didn’t I would buy ALL THE YARN and be out of business very fast. But I also want to support my fellow artisans; Indie Dyers, notions and bag makers, other designers as much as I can and still have money to buy yarn I need for my business. That is why I turn to my Support Currency. See the quick guide here on my instagram stories. There are 3 types of Support Currency. Obviously to most, but not all is buying. A lot of people assume I get lots of yarn and samples for free. That’s true. Through collaborations or my work, yes I get “free” yarn or supplies. But many times even if I know someone wants to gift me something but I really want to support their work I will just go to their shop and buy what I want. Sometimes I will think of what I have coming up and do I know any makers who make or sell what I need for that project that I can support by buying from them. I am very intentional about how I spend my dollars and want to support my fellow makers. As a designer, maker and small business I know all too well that without the support of my customers and friends and community that I would not be here. I would be working 70 hour weeks on a production set somewhere and crocheting or knitting in my hotel room for relaxation. But that support isn’t just about buying my work. am eternally grateful for those who share about my work. That is usspendinging their Support Currency on me. Just as I have a budget for my dollars, I have a sharing budget. There are only so many blog posts and social media posts but I want to maximize them to both serve my audience & my brand. I also want to maximize how I can use those channels for my Support Currency. So I share. I will share another designer. Share about an Indie Dyer. Share about another handmade business. Sharing about them gives my audience exposure to talent I support and it gives the maker exposure to my audience. If I cannot buy something from them or I do not need something, maybe someone I share with does want to buy something. It is expanding reach for both the maker & your audience. Share their content on pinterest. Pinterest is a HUGE way to share or encourage fellow makes. It takes but a minute and is a great way to spend your Support Currency. Just like I am on a budget with my money and how much I can share, I have a limited amount of time. But it only takes a second to spend some Support Currency so it is kind of limitless in a way. Encouragement is such an underrated form of Support Currency. I cannot tell you how many times on a tough day or after a tough thing happened or I was just facing self doubt that I have dug into my “pick me ups” folder to read encouraging messages to pick me up. Or at just the right moment a fellow maker left me a supportive and encouraging word. 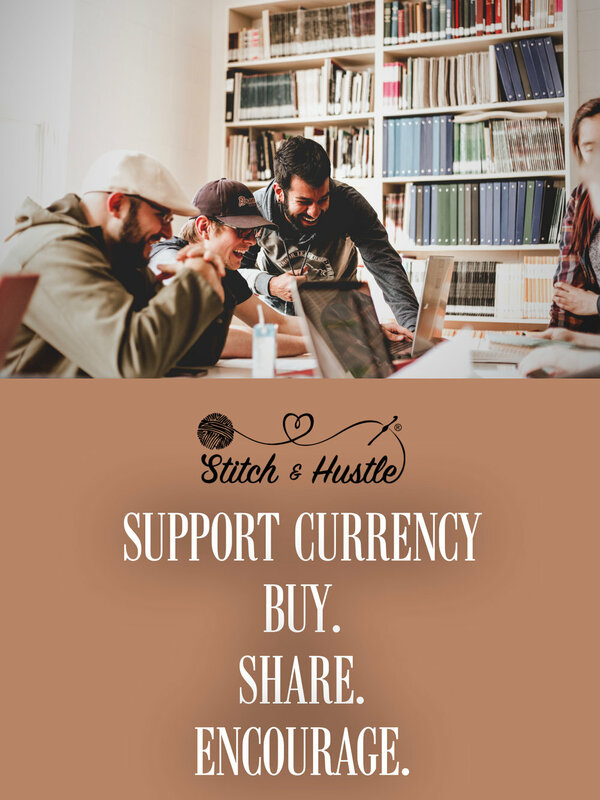 Encouragement is a Support Currency you should be spending freely! Don’t let the algorithms decide who you support. Take a second to INTENTIONALLY go to someone’s Facebook Page or Instagram Page and give them a “like”. Go a step further and leave an encouraging comment. Let them know you thought of them or encourage their journey. Be intentional with your time. Letting the algorithms decide the content you see takes away your intentional use of your time. YOU decide and go spend some Support Currency. That’s it. Ways you can support with or without making a purchase. Let’s lean in and be lifting each other up.